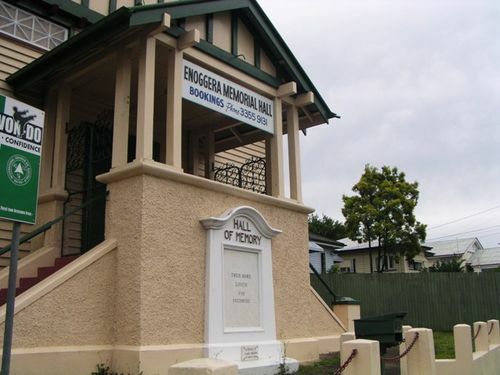 Enoggera Memorial Hall was erected in memory of those who died in servie or were killed in action during World War One. In 1918, the Returned Soldiers introduced the question of a suitable war memorial, and as a result of negotiations it was decided to work in conjunction, with the object of erecting a Memorial Hall, embracing the School of Arts and Soldiers Hall. The stump-capping ceremony for the hall took place on the 11th July 1925 and hall opened in November of that year. One of the largest gatherings seen in Enoggera since the wartime encampments was present on Sunday afternoon at the unveiling of the marble memorial slab in front of the "Hall of Memory," the district's memorial to fallen soldiers. The slab bears the following inscription: "Their name liveth for evermore," while above is inscribed "Hall of Memory. " The Rev. W. P. Brown, chaplain of the forces, who performed the ceremony paid tribute to the work performed by the Australian soldiers in the various war-zones, especially mentioning their spirit of self-sacrifice. "In 1900 it was said that we were a decadent race, too much given up to sport and pleasure," he declared, "but in the late war it was clearly demonstrated that this was not the case, and soldiers proved worthy descendants of noble ancestors." In dedicating the "Hall of Memory and the Memorial Slab" to the 60,000 Australians who will not come back, he asked that all should be lenient in their judgment of returned soldiers, who had suffered by the trials of war, such as shell shock, which in some instances caused men to give way to the temptations of life. Dr. R. Fallon (Baptist), Revs. C. Yuill (Presbyterian). T. G. Moores (Methodist), and J. F. Parker (Church of England) also addressed the gathering, the last-named pronouncing the benediction. An apology was received from the Rev. Father Ahern, regretting his inability to be present, and enclosing a donation to the funds. Bugler Shaw then sounded the "Last Post." Week (Brisbane, Qld. ), 27 November 1925.